In this hands-on webcast you'll learn how to create amazing photo gifts for your family, friends, and clients! Lesa will show you how to create beautiful gifts of all kinds. You'll learn how to make these projects in Photoshop as well as iPhoto, plus you'll discover a variety of online printing resources. Lesa will also throw in a couple of do-it-yourself projects, too. As photographers we create beautiful photos, and the memories those photos bring back can make wonderful gifts... just in time for the holidays. Lesa Snider is on a mission to teach the world to create—and use!—better graphics. She's an internationally acclaimed speaker, stock photographer and founder of the creative tutorial site PhotoLesa.com. Lesa is the author of many video-training workshops (www.lesa.in/clvideos) and the coauthor of iPhoto '11: The Missing Manual. She writes a regular column for Photoshop User, Elements Techniques, and Macworld magazines, and contributes frequently to Design-Tools.com and PlanetPhotoshop.com. 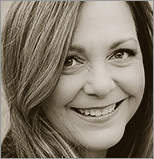 Lesa is also a long-time member of the Photoshop World Dream Team of instructors and can be spotted teaching at many other conferences around the globe. She also teaches Advanced Photoshop for the international graphic design school, Sessions.edu. You can connect with her online on Facebook (www.facebook.com/PhotoLesa), YouTube (www.lesa.in/ytvideochannel), Twitter (@PhotoLesa), and www.PhotoLesa.com. During her free time, you'll find Lesa carving the twisties on her sportbike, dressed up in her Star Trek best at a sci-fi convention, or hanging with fellow Apple Mac enthusiasts. Lesa is a proud member of the BMWMOA, F800 Riders Club, and the Colorado Mac User Group (www.CoMUG.com) a.k.a. the Boulder Mac Maniacs.